So I am writing this post on a day where the clouds have just burst open with rain, which may come across controvert considering the content of the blog post. However, I wanted to turn it around from the gloomy weather by sharing three outfits that I think would be perfect for Spring, especially as it’s just around the corner with the bursts of sunshine that keep occuring in England. After attending the London Fashion Weekend event (written about in a previous post which you can view by clicking on this sentence) and browsing through the new range of clothing on a number of websites, it seems that the signature trend for Spring this year is the 60’s, which is making its way back into fashion of the 21st century. The trend is repeating itself as it brings back tassels, suede, florals, big trousers and denim. 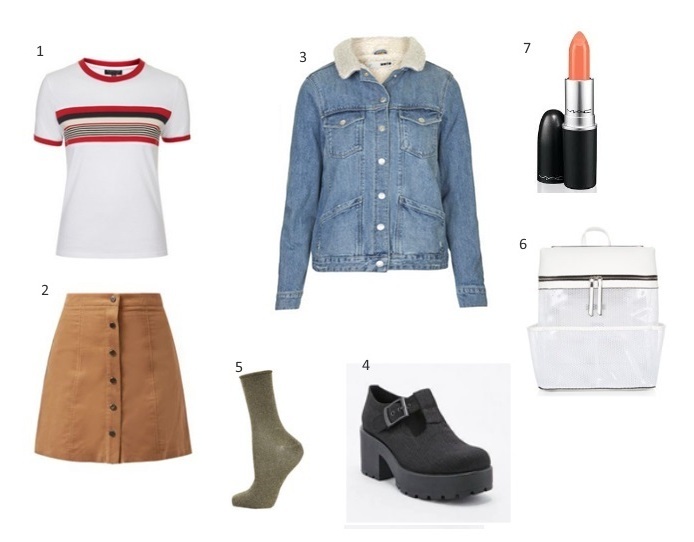 So for this post I have created three outfits based around the trend of Spring 2015 because I’m more than excited to introduce it into my own wardrobe. I have based this outfit on a casual boho wear, by pairing a plain stripe t-shirt with a corduroy button down skirt, overlaying it with a sky blue denim jacket. Chunky shoes are a big fashion yes in my eyes as they bring out any type of outfit from plain to extravegant. Brands are bringing them back from the 60’s into a whole range of shoe types, so I have taken a pair of black Vagabonds and added a pair of ankle socks to wear with them which will make the rest of the outfit look chic. Mesh is a popular material to be used by brands, especially American Apparel, however it’s starting to be brought out as bag material, so I have chosen a sleek white mesh backpack. As you know, I am a big fan of MAC lipstick so you may be learning that I will always add one into my outfits because for me, its a signature move. Here, I think a plush peach colour would finish off the outfit so I have chosen Sweet and Sour. It also seems that culottes are becoming a bold fashion item for women. Not only do they look smart but they are also very classy if you dress them right. I have started with a pair of tailored khaki coloured culottes and matched it with a white mesh crop top to add a bit of light to the outfit, especially for spring. 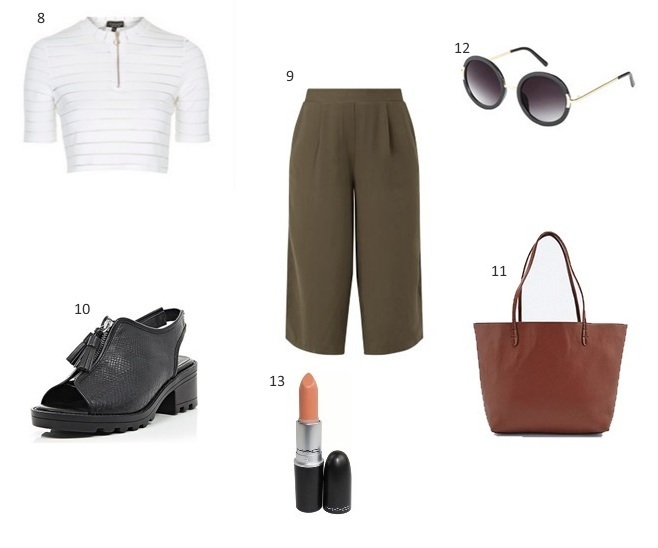 I’ve completed the clothing with a pair of sleek zip front black sandals and a neat brown leather bag to carry those 60’s round sunglasses for when the suns out and of course the essential MAC lipstick. The final outfit that I created is my favourite outfit as it is a very trendy, feminine outfit which I feel would work perfectly in the Spring weather. I’ve chosen a simple t shirt dress in a light grey colour which you can accesorize and dress up in any items or colours you want. 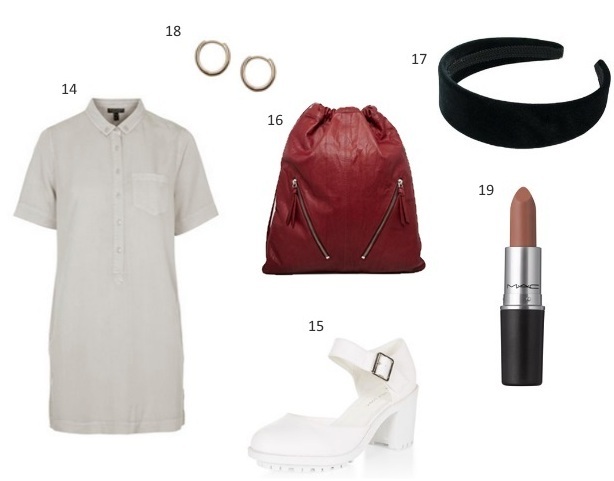 I’ve teamed it with a pair of white chunky strap over shoes that add a hint of 60’s to the dress. I’ve gone with the colour of red to bring colour to the outfit by choosing a red leather backpack which will hang perfectly off the dress. I wanted to steer away from the scrunchie so I chose a plain black velvet headband (just like the one every girl wore in primary school to hold back the fringe they cut themselve). However, I think it would sit perfectly with straightened hair and a middle parting with two little gold hoops hanging in each ear. To finalise the outfit I have chosen a light brown shade to pursue on the lips so it doesn’t clash with the colour of the bag.